To refresh your memory, Knife River has a $1.9 million contract from Linn County to widen and repave Riverside Drive from Oakville Road to Meadow Road, a distance of 2.4 miles. The contract has a completion date of June 22, and judging by the progress so far they’ll make it. As part of the job, a sharp curve in the road has been made rounder. Should prevent some crashes, I would guess. 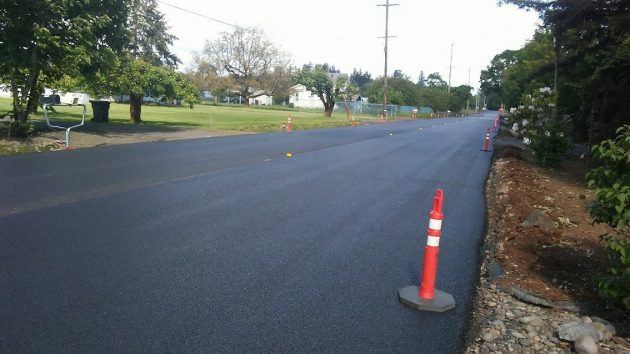 The newly paved section has two 12-foot travel lanes and 4-foot paved shoulders. It’ll make the new segment less risky for drivers and bike riders alike. The new and wider pavement on Riverside near Oakville Road on Wednesday. Taxpayers spent nearly a million-dollars per mile so a few bicyclists can relax whilst pedaling? Was this spending part of the current administration’s infrastructure improvement plan? With this kind of priortization, one can easily imagine a time when fiscal chickens will come home to roost. The project widened the paving to allow a shoulder. That shoulder can be used as a bike path. It can also be used by the locals to do mundane things like walking to a neighbor or checking the mailbox without stepping into the traffic lane. If this road/street were inside a city, the speed limit would likely be 25 ( lots of driveways, no shoulders, no walkways). Problem is that it’s a nifty connector from 34 to West Albany and needs improvement. Nice wide road. The only issue I see is the great big ditches on the side, A cyclist avoiding a vehicle intruding into the bike lane might have an interesting time.